In the days before FBI Deputy Director Andrew McCabe was forced out of his job, he threatened to “torch” the bureau if he was ousted before his full federal retirement benefits kicked in, according to a new report. But McCabe may also have been reacting, in part, to another growing problem beyond the corruption scandals enveloping McCabe’s leadership at the embattled FBI. An FBI insider with Intel inside the embattled Bureau who has vigilantly worked to uncover systemic corruption inside the FBI, is rumored to be penning a tell-all book that promises to blow the roof off the inner-workings of the FBI’s controversial 7th-Floor. 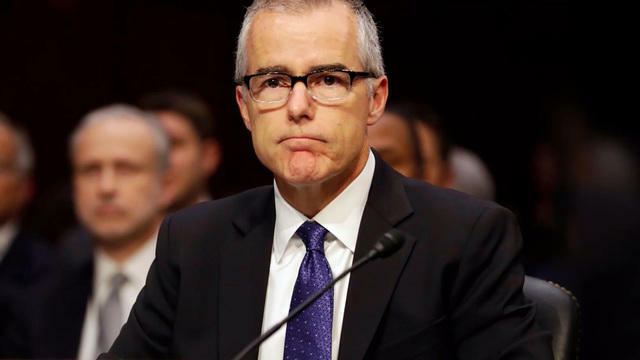 McCabe on Monday said he would take an ‘indefinite” leave of absence, stepping down from his post months earlier than expected. McCabe is set to receive a nearly $2 million pension, according to a Washington Free Beacon analysis. But that taxpayer-funded pension doesn’t kick in until March 18, which is why McCabe decided to take “indefinite” leave. That way, he’ll hit the mark. His decision came just hours before the House voted to reveal a controversial, GOP-authored memo about FBI procedure alleging that FBI higher-ups, including McCabe, Deputy Attorney General Rod Rosenstein, and former FBI Director James Comey abused the the FISA warrantless surveillance program. McCabe has been a frequent target of President Donald Trump on Twitter since being named the FBI’s interim director (following Comey’s firing) and Republicans have viewed McCabe with suspicion, often questioning why the FBI investigation into Hillary Clinton’s mishandling of classified information, which took place under McCabe, was so poorly administered. Meanwhile, an explosive new book claims that McCabe set up a meeting with the White House which was leaked shortly after and was used to the start the “obstructive” narrative in the media and quite possibly in Special Counsel Robert Mueller’s investigation. McCabe claimed to want Priebus to know the FBI’s perspective that this story was not true. Priebus pointed to the televisions that were going non-stop on the story. He asked if the FBI could say publicly what he had just told him. McCabe said he’d have to check, according to the book. McCabe reportedly called back and said he couldn’t do anything about it. Then-FBI director James Comey reportedly called later and also said he couldn’t do anything, but did offer to brief the Senate Intelligence Committee on the matter later that week, suggesting they’d spill the beans publicly. Sounds like Trump’s serious about draining the swamp. A Two million dollar pension ? That ‘s freakn outrageous !! No wonder our government is corrupt and so indebted. This man was part of it .. whether he liked it or not he should go down with all the rest of them and be STRIPPED of any pension ! !